The Dunlop Training tennis bucket is a great choice for training and developing your skills on the court. It includes 60 balls ensuring easy playability and great consistency. The balls feature a pressureless construction for increased durability and they can be used by coaches or in ball machines. The balls are perfect for schools and clubs and come in a bucket providing comfortable transportation. 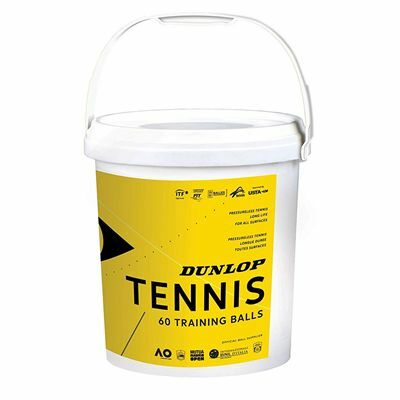 for submitting product information about Dunlop Training Tennis Bucket - 60 Balls We aim to answer all questions within 2-3 days. for submitting product information about Dunlop Training Tennis Bucket - 60 Balls. We aim to answer all questions within 2-3 days. If you provided your name and email address, we will email you as soon as the answer is published. for submitting product review about Dunlop Training Tennis Bucket - 60 Balls.